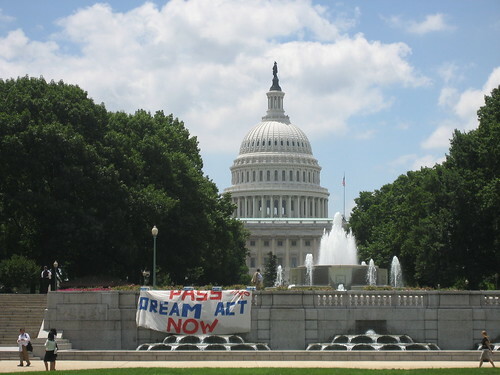 Senator Richard Durbin (D-IL) and Congressperson Howard Berman are marking the two-year anniversary of the defeat of the DREAM Act with congressional hearings on the issue for immigration and education staffers in the Capitol. 2:30 – 4:00 PM in Capitol Hill, Rayburn 2141. Dr. Robert G. Templin, Jr., President, Northern Virginia Community College; Herta Llusho, a DREAM-eligible youth from Michigan; and Noe Guzman, a DREAM-eligible youth from Missouri. Concerned residents are encouraged to contact their representatives and senators to send someone to the hearing, as well as make visits to their local district offices to urge co-sponsorship of the DREAM Act. The Development, Relief, and Education for Alien Minors (DREAM) Act is bipartisan legislation that addresses the situation faced by young people who were brought to the United States years ago as undocumented immigrant children and who have since grown up here, obtained a high school diploma or GED, and kept out of trouble with the law. ← Previous Previous post: Does Obama Get a NOPE on Immigration?